Dare I say pleasant weather, pleasant surprise. This warm weather has been such a nice break. Indian Summer take 2…and hey, why not. I’ve never heard anyone complain about too much summertime. And speaking of summer, I know we are all dreaming about it. So, whether you are dreaming about last summer or this coming summer, it might just be that time for a vacation, if not physical then at least mental. Is there a food adjective that’s appropriate here? Foodal? No? I guess delicious will just have to suffice. Come on Webster, it’s time for some new words. I’m certainly ready for a vacation, and since I’m not heading anywhere anytime soon, I’ll just pretend. If I close my eyes, spin around in a circle, and wind up pointing at a big, giant map, I bet I’ll be pointing at Greece. While I don’t have time for a crazy long flight, I do have time for a short cab ride down to the East Village. Don’t be skeptical. I promise this trip won’t disappoint. Any true foodie knows the next best thing to actually going to Greece is eating authentic Greek food. Attention restaurateurs…there is a lesson here. 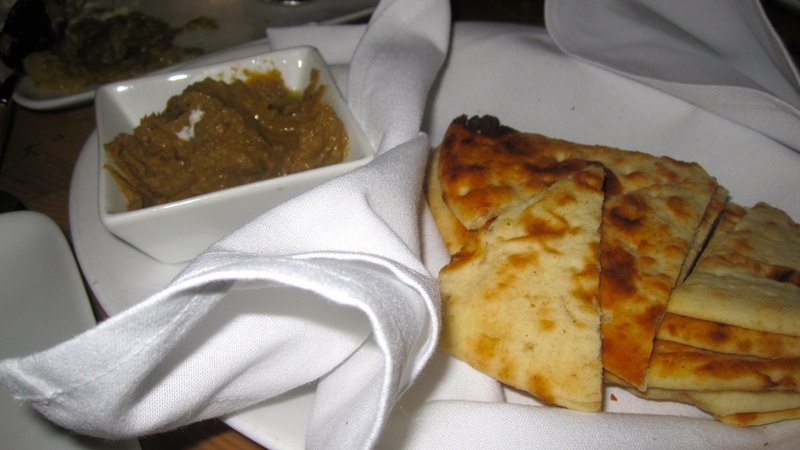 Food can, and should be, transcendental, which is exactly what the food is at Pylos. You know you are in a special place when you walk into this restaurant. The stark white walls are accented by the bluest blue panels and decorated with copper nail heads to match the hundreds of terracotta pots hanging from the ceiling. Beauty isn’t just skin deep at Pylos. The food is equally as beautiful. Pylos has some of the best pita bread I’ve ever tasted. It’s soft and sweet yet slightly salty. And since there are so many Greek options when it comes to dips for pita bread, why just get one? You know this Bite-Size Blonde always thinks two are better than one. And in this case, three are definitely better than one. The Poikilia is a trio dipping sauces — tzatziki, taramosalata and meltizanosalata. Tzatziki is that addictively tangy yogurt sauce. Taramosalata is a citrusy fish dip, similar to lox, but chopped up into a spread. Melitzanosalata is rustic grilled eggplant dip that is irresistible. It’s a fact that if you have a salad named after you, you have to be doing something right. And the Greek’s are definitely doing this right. 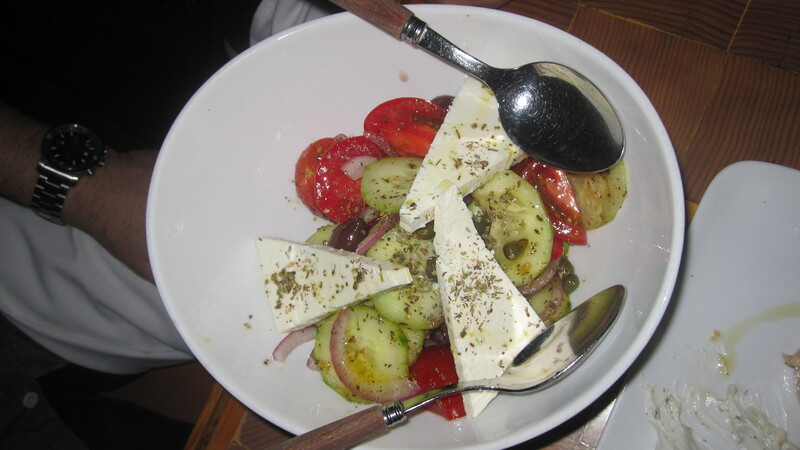 Horiatiki is the authentic name for a classic greek salad, and authentic this is. Forget the lettuce, the veggies speak for themselves. Tomatoes, onion, cucumbers, capers and kalamata olives combine to become an oasis of freshness. The tangy feta cheese adds just the right amount of saltiness to this iconic salad. 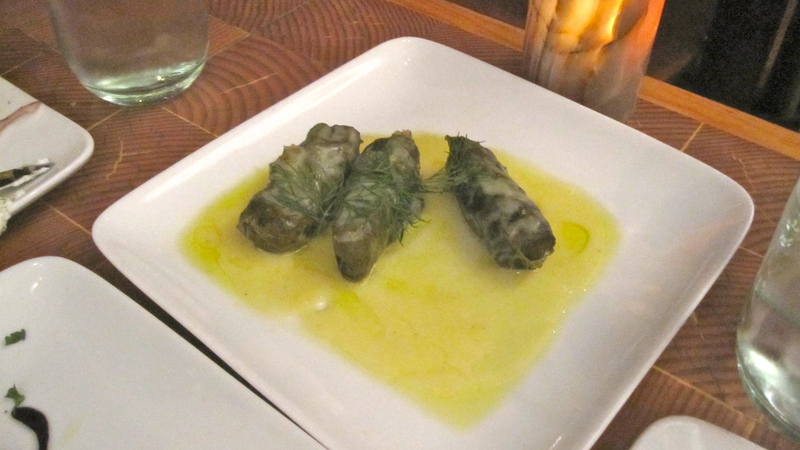 The grape leaves at Pylos are familiar but not ordinary whatsoever. 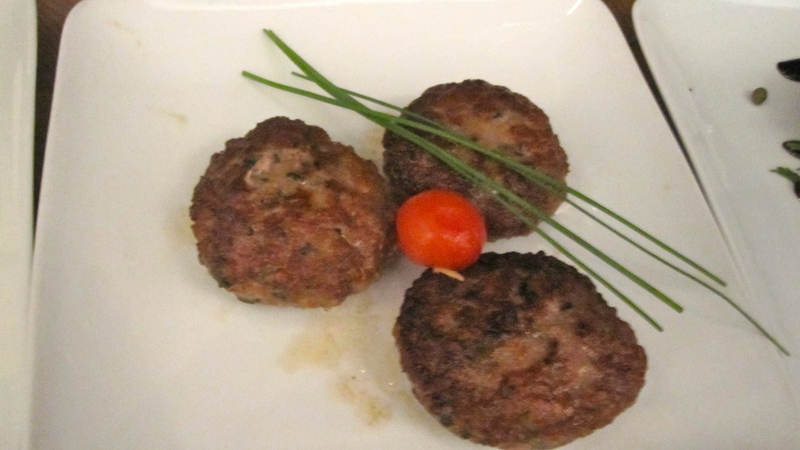 They are stuffed with ground veal, golden raisins and pine nuts and drizzled in a lemon sauce. The Italians get the most praise for meatballs; that’s for sure. But the Greeks know a thing or two about their balls. The seasoning is different, so you can really taste the meat. And more than that, they aren’t camouflaged with sauce. They are simply pan fried in olive oil and left to be admired in all their glory. And admire I will. Ouzo is as Greek as the Parthenon, although I’ll admit I think I like the Parthenon more. Ouzo’s pungent flavor is not a Bite-Sized favorite, but when it’s used for cooking, the harshness dissipates, and leaves a unique concentrated flavor. 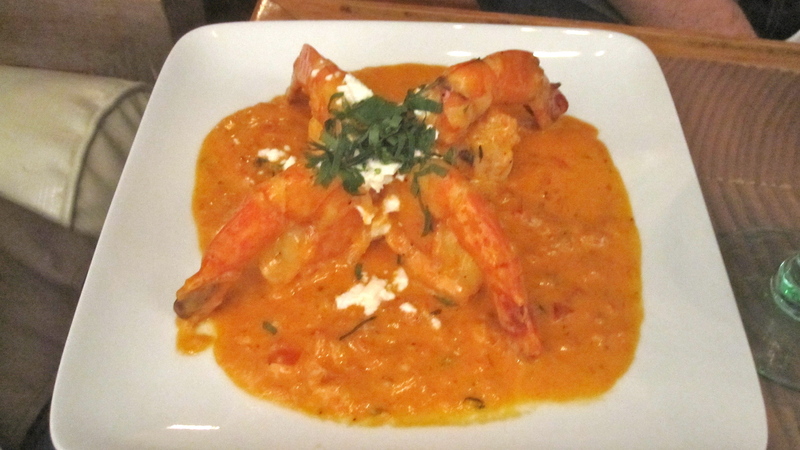 When combined with tomato sauce and cream, it makes a complex sauce for succulent shrimp. 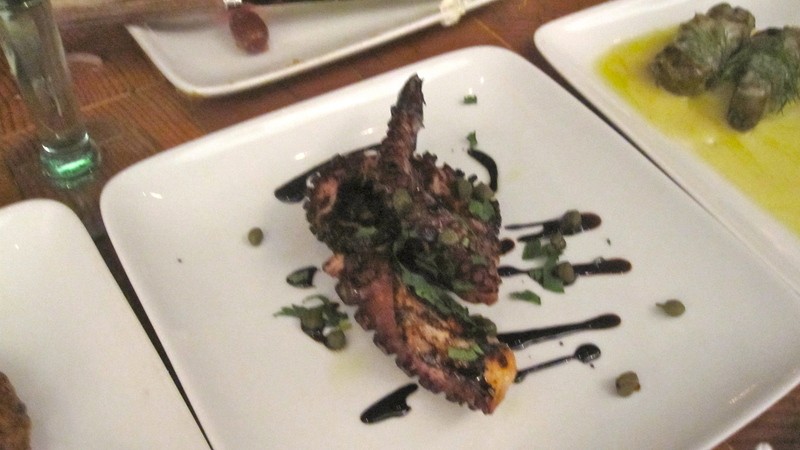 If you’ve never tried octopus, and want to give it a shot, Pylos is the place to try it. The octopus is charred perfectly and tossed in an acidic balsamic reduction. If you learned anything from My Big Fat Greek Wedding, other than windex is the cure for every ailment, it’s that Greek’s love their lamb. 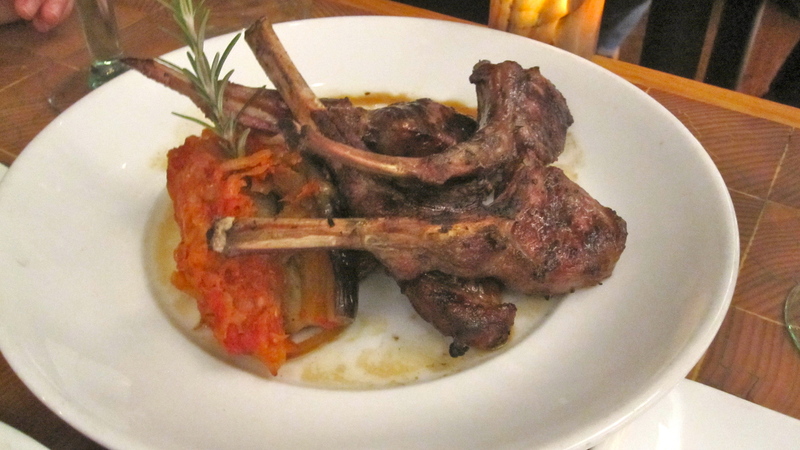 The lamb chops at Pylos are a Greek lovefest, grilled and served with eggplant. This dish is comforting but satisfyingly light at the same time. 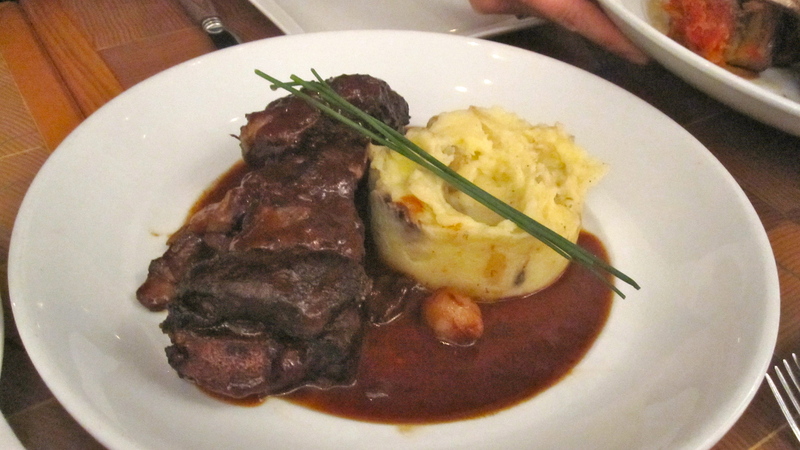 Short ribs are not usually a dish I would think to order in Greek restaurant, just like ordering steak in an Italian restaurant. I was wrong before, and I was wrong again. These short ribs were exceptional. The ribs were fall of the bone tender and smothered in a sea of red wine sauce and potato puree that made me want to lick my fork clean. 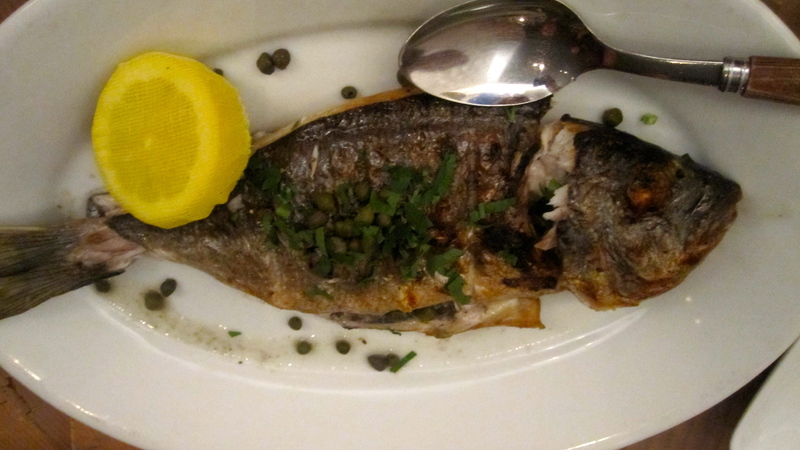 Can you really say you’ve been out for Greek food without ordering a whole fish? The jury is still out, but I don’t think so. Pylos will filet that fish for you, leaving you beautiful, and easily edible filets of delicate fish. Olive oil and fresh lemon juice dress the perfectly grilled fish for a true taste of Greece. Now, it’s not over until the fat lady sings, or in my case, the Bite-Sized Blonde says Uncle. And no one, I repeat no one, can get me to say Uncle sans dessert. If you are thinking baklava, you are going to be wrong. Just this once though. 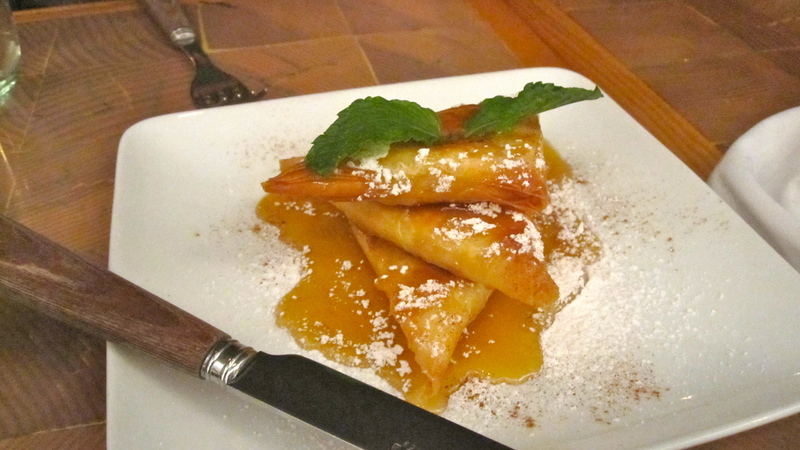 The most underrated and delectable Greek dessert is the Galaktobourekakia, buttery phyllo triangles filled with Greek custard and drizzled with cinnamon and honey. Don’t waste a single second trying to pronounce it, just point to it. Still thinking about that vacation? Yea, me too. But in the meantime, Pylos is just a short cab ride away.